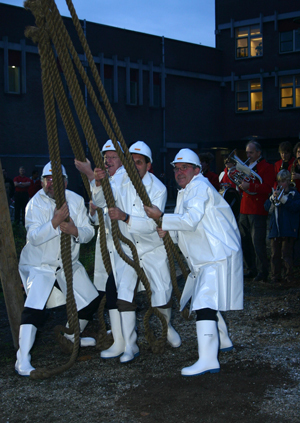 Peter Nijkamp, chairman of the Governing Board of the Netherlands Organisation for Scientific Research - NWO), Cees de Visser, general director of NWO, Pieter Adriaans, chairman of the Governing Board of CWI, and Jan Karel Lenstra, general director of CWI, personally hammered the 'first pole' of the new wing into the ground, encouraged by more than 120 cheering visitors and a brass band. This building event completed "CWI in Bedrijf", CWI's annual day for relations (http://www.cwi.nl/cib/). The new wing and the renovation of the old building will be ready in 2009.